First off, let me apologize for not posting in many days. My plan was to post on Sunday night and then again on Monday but, this just did not happen. My apologies to all of my loyal followers. Okay, let’s talk food. As I’m sure you have all seen, Taco Bell is now promoting ‘Live Mas’ as their slogan along with the Doritos Locos Taco. Basically, the hard shell of the crunchy taco has been replaced with a Nacho Cheese Doritos Shell. I had no interest in this item whatsoever. The launching came and went and I still felt the same. But then all of the food blogs that I read, all blogged about this. So, even though I am behind the game, I thought I needed to do the same for Grandma’s Backyard. On Saturday the 17th, Taylor and I walked in the St. Patrick’s Day Parade with Parks and Rec. We arrived at about 9:30 and didn’t leave the downtown area until after 2pm. Traffic was crazy trying to leave. We were both quite hungry and decided on Taco Bell for lunch. 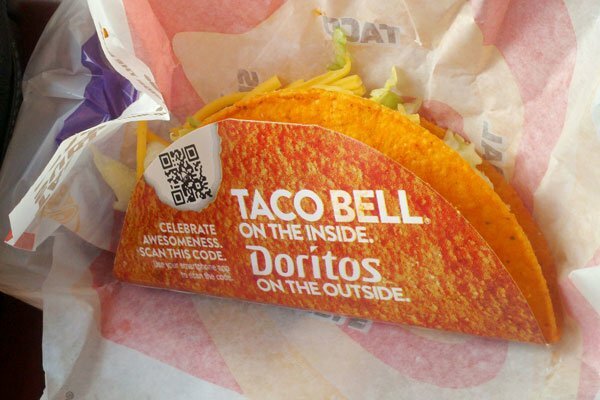 Perfect time to try this Doritos Locos Taco. I ordered a Doritos Locos Taco Supreme to try. Once at home, I unwrapped the Doritos taco. It was wrapped in the regular packaging and also the Doritos holder. I like the concept and use of the taco holder. This should be used on all of their tacos to keep the taco together. Obviously for the sake of the Doritos taco, it is used so you do not get Doritos dust all over – and this I do appreciate. The taco appeared to look just like a regular taco. This taco was extremely full with toppings. I find that the Taco Bell near me, is never consistent on the amount of fillings. You either get a good amount or get barely any – certainly something to work on but, obviously it’s just fast food so I’m sure no one cares. My Doritos taco was packed full. The layer of soy-meat was the typical from Taco Bell and tasted fine. There was a lot of lettuce & shredded cheese which were both cold in temperate and quite tasty. The sour cream was just enough to be tasted but not be crazy and the few tomatoes that topped my taco, were good and fresh. All of the toppings work together well, as they always do. I always like when the tacos are more full, especially with lettuce. I know, I’m quite odd. Now, the star of the show is meant to be this Doritos shell. The shell of all shells. The shell that can make people drive hundreds of miles just to eat one. Well, sorry to let you all down, but the shell is not that great. The crunchiness is perfect – just like a regular shell is. The shell holds together great and the sleeve makes it even better. But the taste of the shell, is just sub-par. I can sorta taste Nacho Cheese Doritos and the smell is kinda there but neither of these factors really stands out to me. With every bite that I take, I think that maybe the taste will get better or more in depth but, it just doesn’t. Maybe I was just expecting that overpowering Nacho Cheese taste but, am I wrong in expecting that? 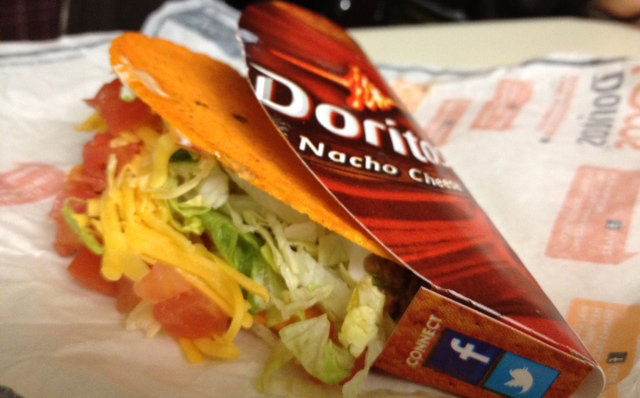 If the taco is said to have a Doritos shell, it should taste like…Doritos? In my case, it’s not really a bad thing but, that’s not the point. The lack of flavor just makes me think why even bother? Why would I ever want to spend the additional money for this Doritos taco rather than just a regular taco? My conclusion of this Doritos Locos Taco? It’s just nothing special. It is a basic Taco Bell taco with a different color shell. A shell that contains a very slight hint of Nacho Cheese Doritos. The key to this taco is to go in not expecting anything. Do not let the orange color or the cool sleeve blind your mind of what it will taste like. Go into it like any other taco and come out of it realizing you just ate any other taco. For me, I tried it, I reviewed it and now I can say, No Mas.